Objective: Thoracic hyperkyphosis is a serious postural health disorder that is associated with many health conditions including morbidity and mortality. Methods: We reviewed all clinical evidence for the treatment of hyperkyphosis by Chiropractic BioPhysics® technique methods. 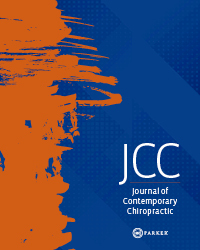 Seven peer-reviewed papers were located that included 4 case reports, 2 case series, and 1 randomized clinical trial treating the cervical spine reporting reduction of the thoracic curve. Results: Although the amount clinical evidence is small, these studies document successful reduction in thoracic curve by an average of 12° concomitant with the improvement in pain, disability, quality of life measures and in some cases improvement in vital capacity. There was large variation in number of treatments, duration of treatment and age of patients. Although there are some clinical trials demonstrating improvement in thoracic kyphosis primarily by exercise programs, the changes are small and most report on suboptimal mensuration methods that do not directly relate to the gold standard x-ray measurement. Only 2 previous exercise intervention trials have reported pre-post x-ray improvements in thoracic alignment, and this was 3°. Conclusion: If future CBP intervention trials are consistent with the initial CBP patient outcomes for this disorder, the CBP treatment approach may prove to be an effective treatment that may logically lead to reduced mortality rates and improvements in quality of life measures in these patients. 20. Milne JS, Williamson J. A longitudinal study of kyphosis in older people. Age Ageing 1983;12:225–233. 21. Anderson F, Cowan NR. Survival of healthy older people. Br J Prev Soc Med 1976; 30:231–232. 22. Cutler WB, Friedmann E, Genovese-Stone E. Prevalence of kyphosis in a healthy sample of pre- and postmenopausal women. Am J Phys Med Rehabil 1993;72:219–225. 37. Katzman WB, Sellmeyer DE, Stewart AL, et al. Changes in flexed posture, musculoskeletal impairments, and physical performance after group exercise in community-dwelling older women. Arch Phys Med Rehabil 2007;88:192-199. 13–16, 2015. Paper No. 184 Mediterranean Region Award Winning Paper. 62. Panjabi MM, White AA, III. Biomechanics in the musculoskeletal system. New York: Churchill Livingstone, 2001. 63. Bogduk N. Management of chronic low back pain. Med J Aust, 2004;180: 79–83.